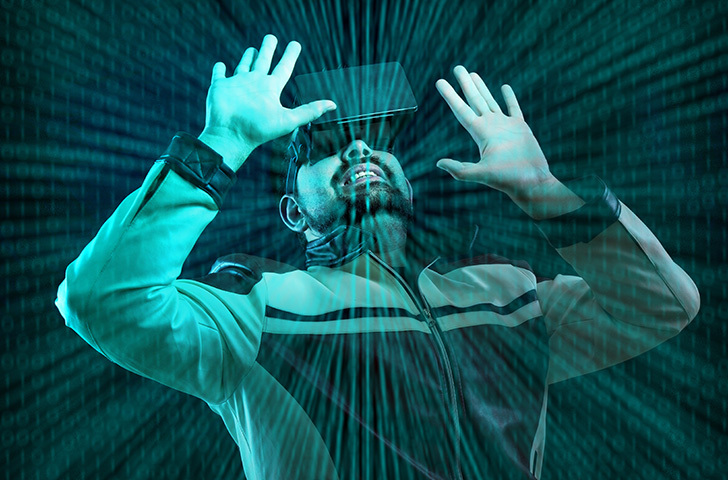 Virtual reality is finally here, and it’s revolutionizing entertainment. 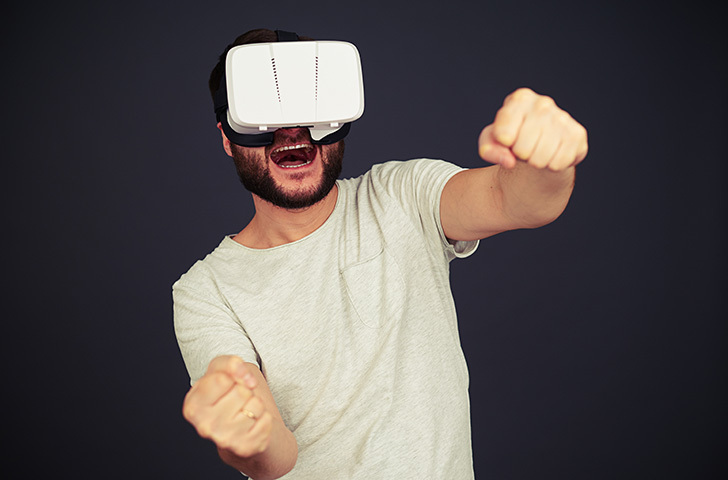 You can now put your phone in a plastic box, strap that box to your face, and immerse yourself in the world of, say, animated rabbits. 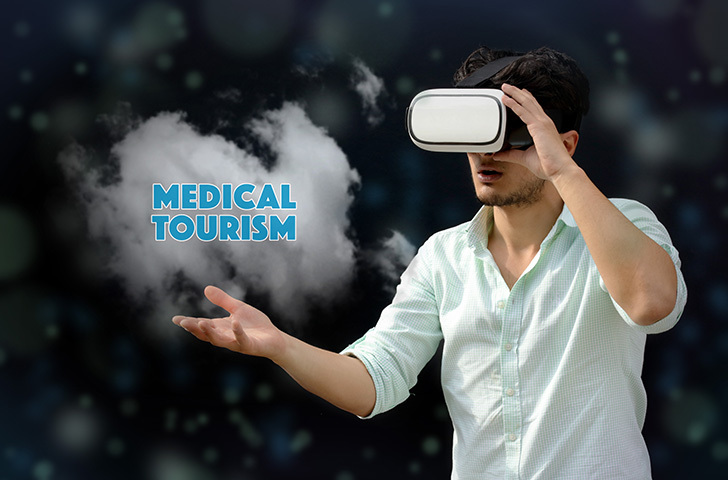 It’s exciting, but what’s even more exciting is the accompanying deluge of delightfully terrible stock photos. 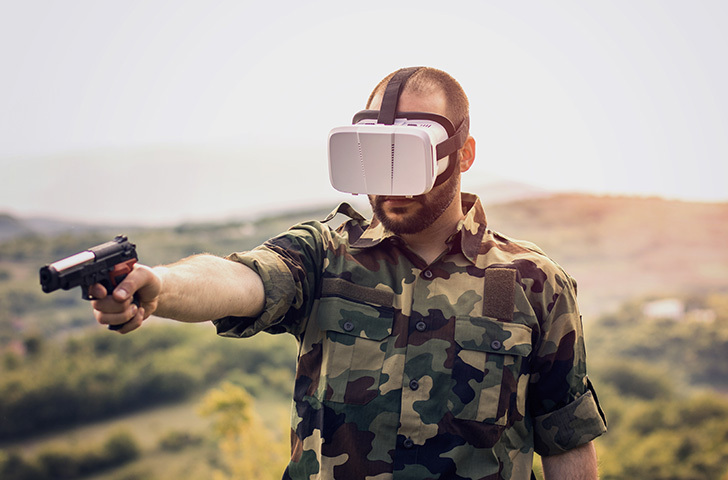 Enterprising photographers have jumped on VR like it’s the next hoverboard, apparently without any real understanding of how people actually use it. As far as I can tell, they just handed knockoff headsets to moderately attractive models and told them to, “Look super excited or scared or whatever.” The results are glorious. I poured hours into curating the below images to bring you the best of the best—hackneyed CG graphics, unnatural poses, and a healthy dose of over-enthusiasm—all to help you see the potential of this new technology through the world’s most oblivious art form. 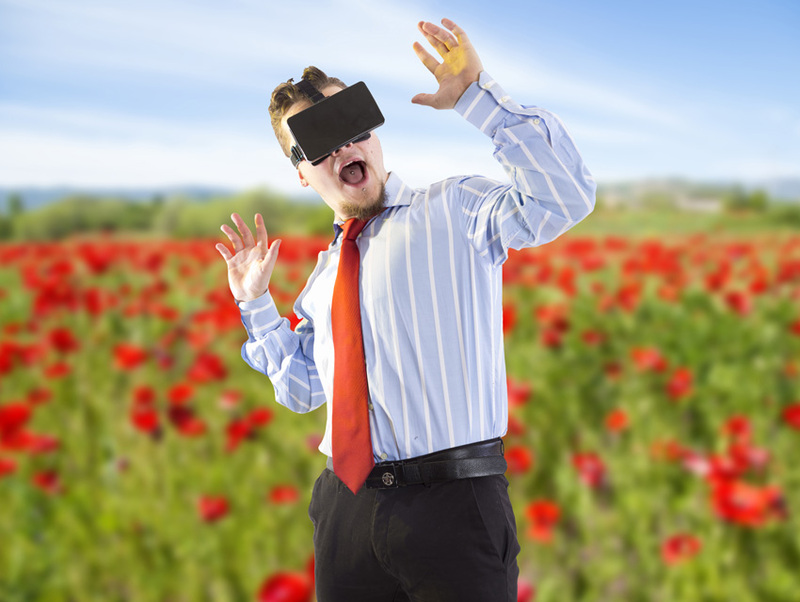 First, it’s important to realize that virtual reality is intense. Like, really intense. To actually have an immersive VR experience, you need a solid pair of over-ear headphones. Otherwise, while you’re visually flying through cyberspace (or whatever this guy is doing), all you’ll be able to hear is your roommate Brian eating a bowl of tortellini while watching BoJack Horseman on his laptop, and that definitely kills the mood. 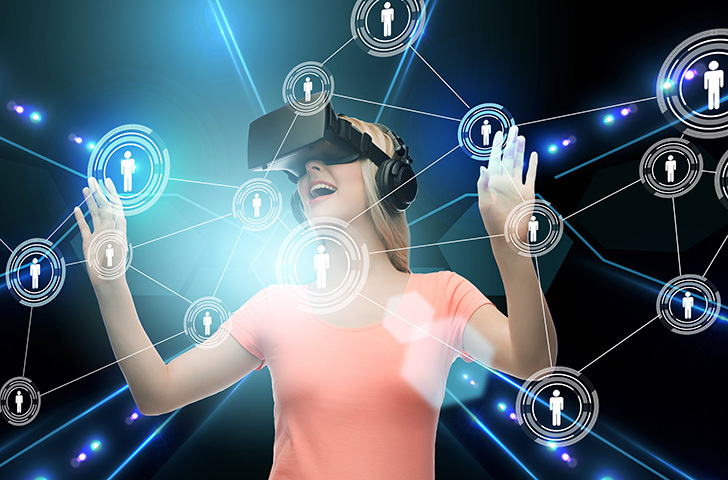 If you can find a VR stock photo where the model is wearing headphones, though, I’ll give you fifty bucks. Virtual reality can also help you be productive. 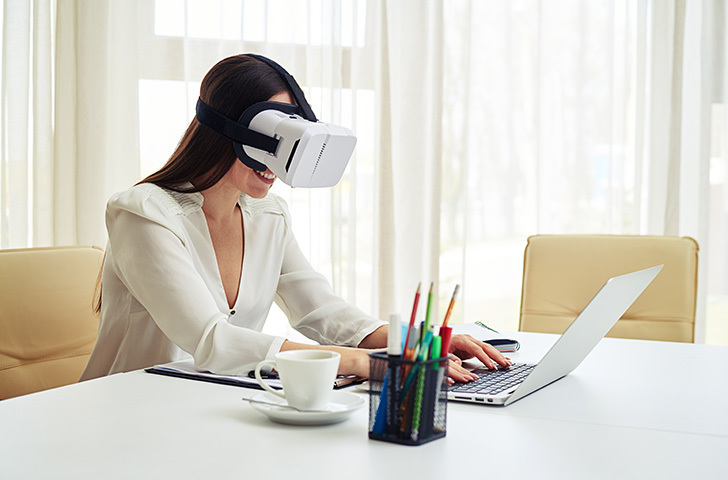 This woman is wearing a VR headset while typing on her laptop. I won’t pretend to understand how that works—you can’t see “out” of the headset, after all—but I’m sure it’s super efficient. 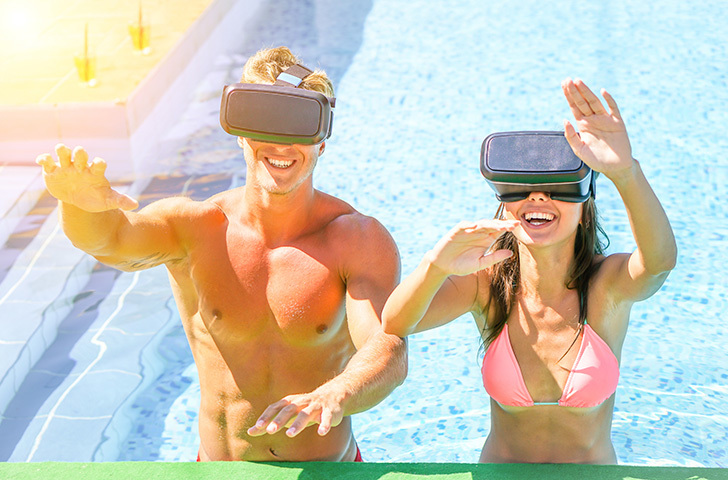 Never mind that virtual reality headsets are electronic devices, you can totally use them in a pool. I’ve definitely heard someone call them “goggles” before, so yeah. You can use them while shooting a gun. This doesn’t seem safe at all. 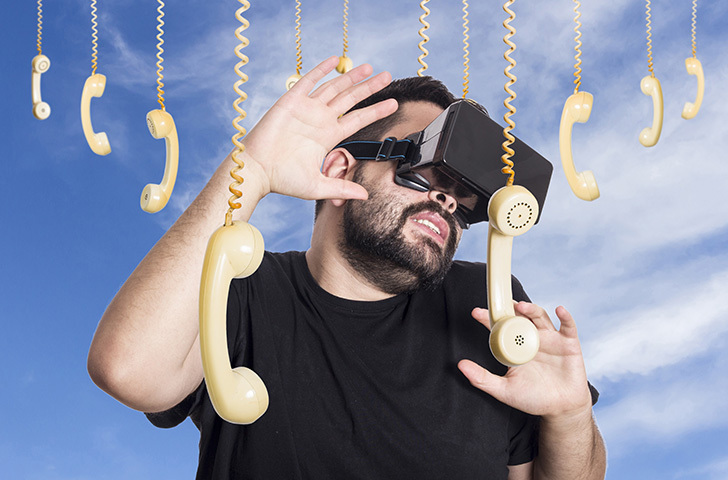 In virtual reality—unlike real life—you run the risk of being overwhelmed by outdated phones that dangle from the sky. 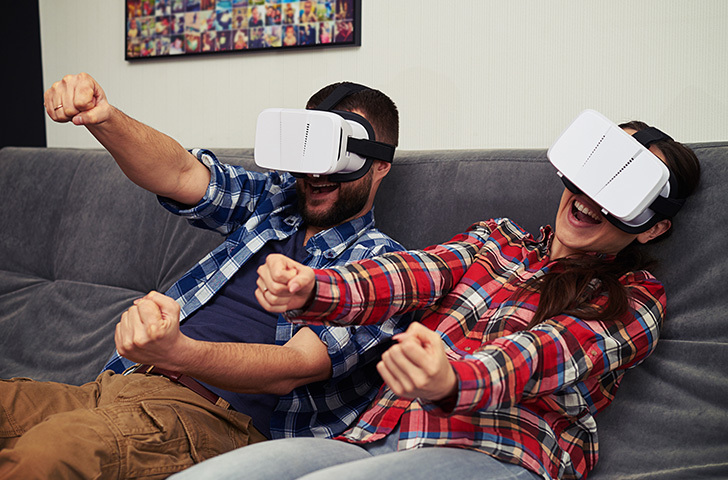 This photo is baffling because, unless you’re holding a controller (which this guy is not), you can’t interact with anything in the virtual world—not even virtual steering wheels. 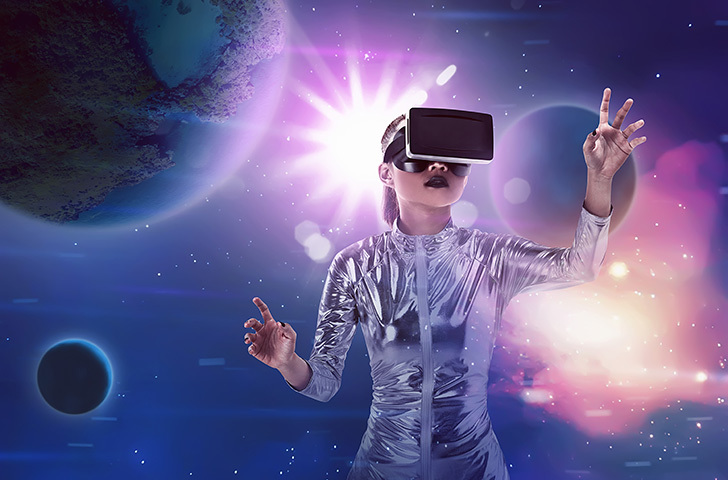 Virtual reality isn’t Disclosure yet. You can’t buy Ready Player One-esque haptic gloves that allow you to touch virtual objects. Making fists and holding your arms out in front of you does literally nothing. 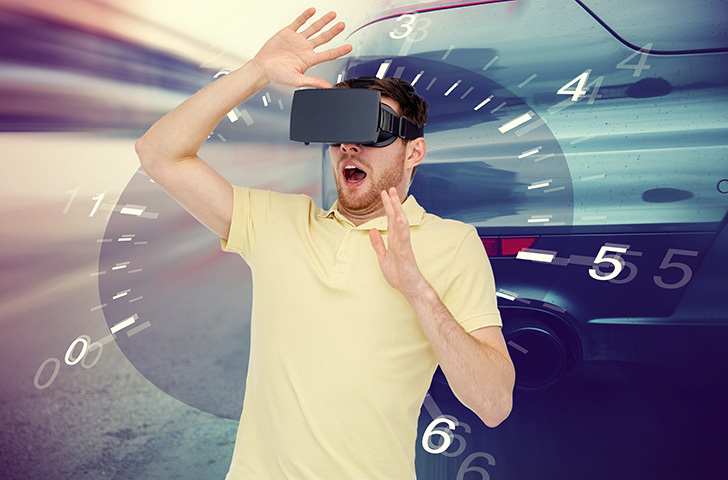 The whole “driving” thing is a common fallacy in virtual reality stock photography. If you’re a guy, pretty girls will like you and give you back rubs when you use virtual reality. Why wear actual clothes when you can wear virtual clothes? —especially when your virtual clothes are a tasteful silver space-onesie. Sometimes in virtual reality, you go inside of a tachometer, and it’s awesome. Sometimes in virtual reality, you interact with humanoid robots. Wait… now I’m confused. 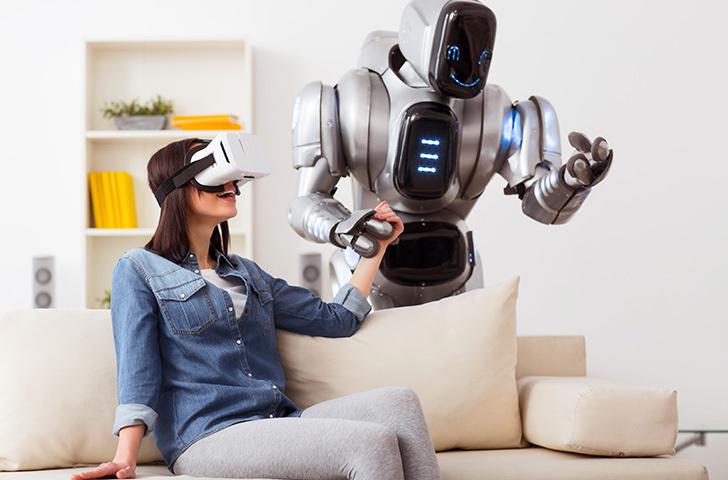 At first I thought that robot was part of the virtual world the woman was experiencing, but no, it’s definitely actually there in the room with her. So confused. The caption for this one is, “Edge between fiction and reality. 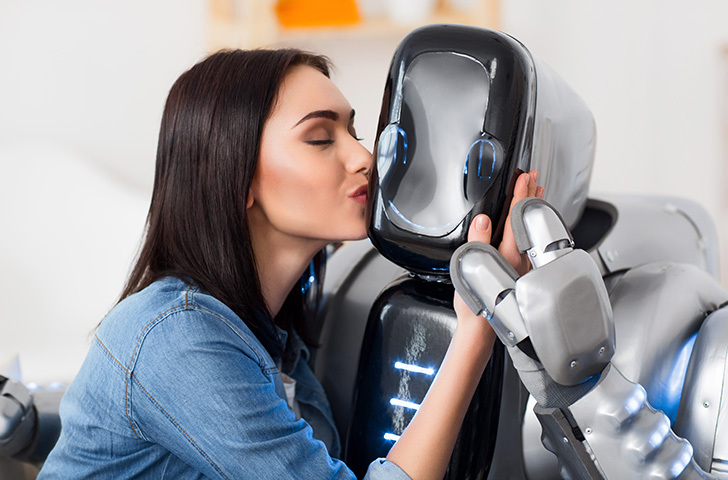 Cheerful delighted beautiful girl kissing robot and closing her eyes while resting together.” Which explains nothing. 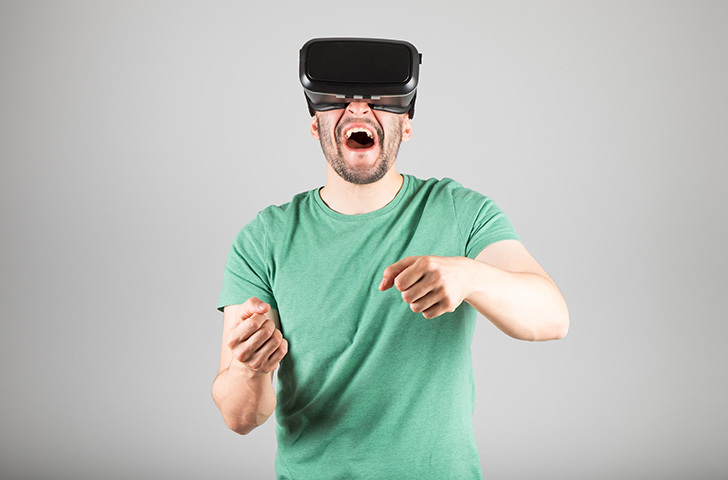 Virtual reality can be a lot like that dream you have from time to time—the one where you have to pee really bad but can only find bathrooms for the opposite gender. OK, OK, I owe you $50. 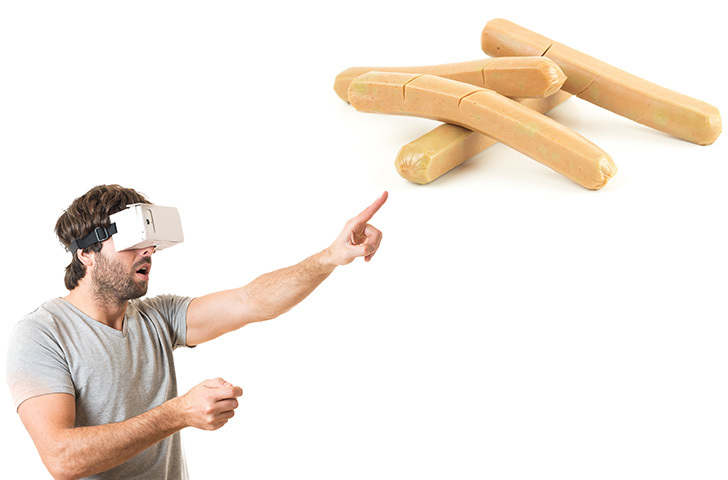 More fascinating than anything, though, is virtual reality’s ability to bring you up close and personal with a pile of slippery vegan hot dogs. Whatever your opinions about immersive technology are, you’ll have to agree that that’s beautiful.